Intel’s new third-generation Ivy Bridge processors offer a performance boost (especially in the graphics department) with lower power usage, but overclocking these chips to gain even more speed may be a bad idea. Several tests find Ivy Bridge processors to run much hotter than second-generation Sandy Bridge chips when significantly overclocked. Overclocking, for the uninitiated, refers to running your hardware at a faster speed than the manufacturer intended--so you can squeeze the most performance out of your processor, graphics card, memory, or other computer component. PC enthusiasts push the limits of their hardware by overclocking. Unfortunately, Intel’s new Ivy Bridge processors may get dangerously hot when pushed too far--as much as 68° F (20° C) hotter than Sandy Bridge processors, according to independent overclocking tests done by AnandTech, Tech Report, and Overclockers. Pushing an Intel i7-3770K processor over Intel’s peak 3.9GHz rating for this chip to 4.9GHz or above and with the CPU voltage increased as well, the CPU rises to around 212° F (100° C)--which is hot enough to boil water. This is significantly hotter than the 176° F (80° C) measured for a Sandy Bridge chip running at the same 4.9GHz. 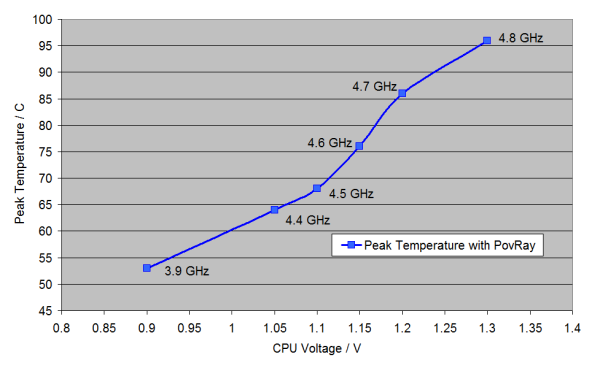 The biggest leaps in temperatures occur when the voltage is ramped up significantly, as this AnandTech chart shows: Going from 1.05 volts to 1.30 volts at 4.4GHz CPU frequency, the temperature rapidly rises from a stable 149° F (65° C) to more than 194° F (90° C). Why Does Ivy Bridge Run Hotter? 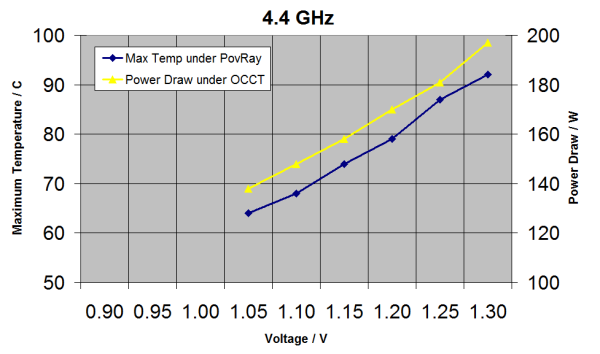 Why should the Ivy Bridge chips, which are more power efficient than Sandy Bridge, run hotter? Ivy Bridge packs more transistors into a smaller area than Sandy Bridge. That means increased thermal density--heat generated in a given area. It's harder to cool processors where the heat is concentrated into a small space. Modern CPU chips have a "heat spreader" on top of them. It's part of the processor package. The Sandy Bridge heat spreader was soldered on, while the Ivy Bridge heat spreader makes contact with the CPU using thermal paste. It may not be conducting heat as well as the Sandy Bridge's soldered heat spreader. 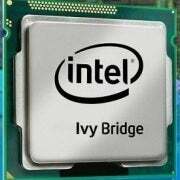 Ivy Bridge usually runs using a lower operating voltage than Sandy Bridge. But to overclock it way up to 4.9GHz, you have to bump up the voltage. In fact you have to add more voltage to an Ivy Bridge processor than a Sandy Bridge processor to reach that level. Since power consumption is strongly related to operating voltage, this means you're adding more power consumption and heat. Intel's 22nm manufacturing process is quite new, while the 32nm manufacturing process used with Sandy Bridge is more mature. As the months roll on and Intel improves its 22nm process, leakage and heat dissipation may improve. The bottom line is that extreme overclocking isn’t recommended for Ivy Bridge systems--take care when increasing the CPU voltage above a few hundred MHz. Otherwise, you may end up creating more heat than necessary in your laptop or desktop computer, which can shorten the lifespan of your hardware and lead to stability problems.